Maintaining a healthy diet is important throughout our lives. But as we get older, the onset of medical conditions and lifestyle changes can lead to the need to adjust our eating habits. As we age, health concerns may revolve around our memory, our safety and our ability to take care of ourselves. One easy way we can help manage these health issues is by eating right. Keeping mealtime as a way to enjoy friends and family is another, says Ami Hall, DO, medical director of the GEM program at Euclid Hospital. “In addition, maintaining a regular schedule and not skipping meals and eating with others, which makes meal time more enjoyable, can be just as important as what we eat,” Dr. Hall says. 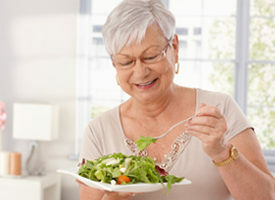 For some older adults, that may mean making a focused effort to eat regularly. Other factors — such as illnesses, medications and change in metabolism or digestion — can lead to weight loss or gain. Add fiber to meals with food such as whole grains, and raw fruits and vegetables. Reduce your cholesterol and fat intake and make smarter choices by enjoying or preparing food with healthy fats, which include olive oil, avocados, salmon and walnuts. Reduce salt consumption by seasoning dishes with garlic, herbs and other spices, and choosing foods that are low in sodium or have no added salt. Avoid “white foods” like bread, rice and potatoes, which provide no long-term nutritional value. Drink six 8-ounce glasses of water or other beverages daily and avoid those that contain caffeine and alcohol. Maximize your vitamin D intake by increasing your exposure to sunlight and eat foods high in vitamin D, such as fatty fish, canned tuna, egg yolks, fortified milk and cereal or supplements. Be sure to talk with your doctor about how to eat right for your best health, Dr. Hall says. Your doctor may make other recommendations based on your unique medical history and overall state of health. For example, an older adult whose blood pressure drops when they stand up may need a diet higher in salt, she says. “It’s important that older adults who experience changes in appetite and weight see a doctor before making any significant dietary changes,” Dr. Hall says.